Afonso de Albuquerque arrived at the Indian Ocean in 1506 commanding a squadron of five war vessels integrated in Tristão da Cunha's Armada. In the summer of 1507, after the conquest of Socotra, the Armada's main objective, Afonso de Albuquerque parted on its own commanding a fleet of six vessels and 500 marines to take the easternmost island at the entrance of the Persian Gulf, called by local folk Hormuz. Defeating a garrison of 15 000 men with his artillery, Albuquerque took Hormuz and commissioned the construction of a fortress. Though not exactly making the narrowest point of the passage between the Persian and Oman Gulfs, this island would eventually lend its name to one of the most important choke-points of the Indian Ocean, at the time the principal commercial pathway of commodities from Asia to Europe. With him Afonso de Albuquerque had brought from Lisbon a sealed letter from the King appointing as Vice-King to the East Indies, replacing Francisco de Almeida, whose strict naval prowess strategy didn't fancy the territory thirsty King. A period of indecision ensued, with most naval officers in the region initially refusing Albuquerque's rule and Hormuz was lost. In 1515, in his final days as Vice-King, Afonso de Albuquerque stormed Hormuz once again, taking it for good without military resistance; the fortress, that lasts to this day, was finally completed, sealing the command over the commerce in the region. After the Portuguese came the Persians and then the English; the importance of the fortress waned, but of the Strait of Hormuz itself, if anything, it has only increased. Commodities flow in the opposite way these days, but unlike the luxury and exoticism of the past, today they are vital inputs to the world economy. About a month ago, when Iranian officials started venting the idea of closing the Strait of Hormuz to commercial traffic, the western media was prompt in bringing back the events of 1981. At that time Iranian forces spawned sea mines in the Strait and engaged commercial vessels with rubber speedboats, in what was largely seen as pathetic actions. The media seems to think that Iranian officials are talking about the same sort of tactics today. In reality the military technology deployed by Iran in the region is completely different today, making up for a military scenario totally apart from that of 30 years ago. Before moving on, it is worth taking a closer look at the geography of the region. First of all Iran is a very large country, with an area of almost 1 700 000 km2 making up more than Spain, France, Italy and Germany combined. To its south Iran has a long coast, almost 1700 km long, that makes up all of the north shores of the Persian Gulf (hence the name) and of the Gulf of Oman. Along this coast lay numerous islands of assorted sizes, including Levan, Hendorabi, Kish, Forur, Sirri, Abu Masa, the Tunb twins, Qeshm, Hengrn, Lark and of course Hormuz. All these island are found west of the Strait, Hormuz being effectively the eastern most of them all; Qeshm is by far the largest of these islands, with 1490 km2, it is larger than all the other islands together. Contrary to what its name suggests, the narrowest section of the Strait is along the south eastern shores of Qeshm, between the smaller islands of Hengrn and Lark. Between Lark and the smaller isles of Oman there are less than 40 km. Sovereignty over the Strait waters is divided by Iran and Oman, the northern half is shallower, less suitable for large vessel navigation; being deeper, the Omani half provides for the narrow naval corridors that make up what has been for centuries one of the world's most important commercial routes. The Strait of Hormux. Source: Wikipaedia. In the first part of this log I'll look into the military technology Iran has today to act on the Strait; then I'll drawn several hypothetical strategic scenarios that may develop in the region. In this part I'll go through several technologies that seem relevant in the military chess of the region; though somewhat long, this list isn't exhaustive. I've no access to military intelligence, hence consider this a picture with many blanks to fill. Besides that, it is important to note that the weaponry industry recurs today to many of the marketing tactics used by civilian industries, the information they release to the public should never be taken as complete or totally accurate. And finally, many of the weapons here described were never used in combat (and I hope they never will) which only adds to the uncertainty of the information in the public domain. The most important weapons Iran has in the region are its anti-ship missiles, a plethora of technologies that allow to remotely target sea vessels without much exposure. The following paragraphs run down from smaller to largest. These are small air to surface missiles developed in China to target small vessels, with less than 200 tones displacement. They are subsonic and have a short operational range, no more than 20 km, but its low flight altitude, less than 20 meters, and the continuously development of its guiding system guarantee a high rate of accuracy, over 95%. China seems to produce a special version with an upgraded guidance system of this missile for the external market called C-703. 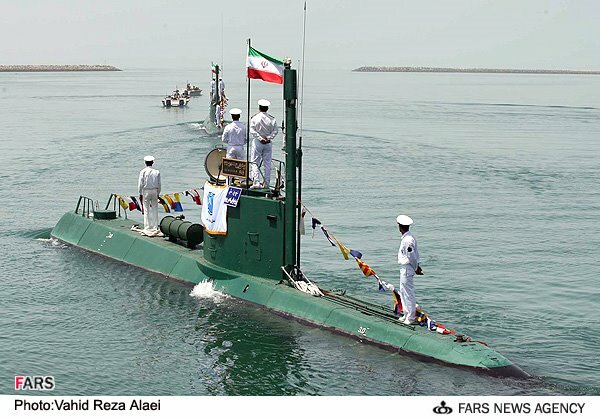 Iran itself produces internally another version developed to be launched from ground vehicles (and possibly sea vessels), called the Kowsar. With further upgrades to its guidance system, Iranian officials have claimed it can resist electronic interference. Due to its short range, this family of missiles need some sort of exposure to be deployed outside Iran's borders, even in the Strait, to have to either by fired from the air or from small sea vessels. This requires some degree of air supremacy for a sustainable usage during a military conflict. A Kowsar was likely the weapon used by the Hezbollah to hit the INS Hanit, 10 nautical miles (18 km) off Beirut in 2006. The Israeli corvette (over 1000 tons displacement) was severely damaged but remained afloat: with propulsion systems functioning partially it was able to retreat to safety and head back to Israel for repairs. A controversial aspect about this event was the fact that the automatic missile defence system on board the corvette was switched off, thus it remains unknown how resilient is the Kowsar to this sort of defence. This is the big brother to the C-701, with similar top speed, cruise altitude and accuracy. The main difference is its size, capable of transporting a warhead of 130 kg, four times that of the C-701, thus able to menace sea vessels up to 4000 tones of displacement. Another difference is a higher range, over 30 km, thus able to hit targets in Omani waters from land based launchers. Their main strength seems to be their low cost compared to other weapons able to target similar vessels. The number of units Iran has acquired from China is not public. In 2008 Iran successfully tested a home made missile called Nasr-1 that seems to be an upgrade of the C-704, with a larger warhead (150 kg) and a slightly longer range. Iranian officials have since then been quoted in the press saying Iran is presently mass producing these missiles; how many it may have produced already is an open question. Further tests have followed, always presented to the press as a success. The relevance of this class of short range missiles is its numbers, though I couldn't track down a precise figure, some reports pointed to an arsenal over 300 units already at the beginning of the century, before both the Nasr-1 and the Kowsar went into production. This was a class of very large missiles developed in China from originally Soviet designs. During the Iran-Iraq war the Chinese sold them to both sides and they were used in several important actions during the conflict. In general, these missiles carry half tone warheads and have operational ranges in excess of 150 km. The C-601 was the air launched class of this family that was also used by Iran against Iraq. Earlier versions were not very accurate (about 70% hit probability) and today wouldn't have much chance against modern defence systems. China kept supplying these missiles and an upgraded version, the C-201, to the Middle East; in 1988 sales of these weapons to Iran officially stopped, but Iran has today the capabilities to produce them. I haven't found information on numbers and more importantly, on what technological upgrades Iran may have introduced. In any case the original Silkworm version is a very able weapon to hit commercial vessels or other unprotected civilian targets, like it successfully did during the Iran-Iraq war. The C-802 is a high-range, high-accuracy missile developed in China. It is a two stage rocket, that once at cruise speed detaches part of the fuselage containing the take-off fuel. Cruising speed is just under Mach 1 (the speed of sound) and the autopilot can lower cruise altitude below 10 meters if the sea isn't rough. It is highly resilient to electronic interference and has a low radar signature; accuracy is reported in excess of 98%. It carries a 165 kg warhead capable of piercing warship armour. This missile is also thought for large vessels, even larger than those targeted by the C-704. With a range of 200 km, this is clearly a fierce weapon, providing its owner serious military projection. Iran ordered 150 C-802 from China in 1991. Shipping eventually stopped in 1996 under the pressure of the US with only 60 units delivered, a move that attests the relevance of this weapon. Though they can be deployed from air, sea or land, it is though that Iran has all its C-802 in mobile land launchers, spread around the shores of the Strait of Hormuz and the Persian Gulf. In spite of the suspension of deliveries from China, Iran was able to develop its own version of this missile, called Noor, possibly introducing further developments. Numbers are unknown but this weapon has been in production for several years; at least one successful test was reported by the press in 2006. This is one of the tactical questions of the Strait of Hormuz: how many Noor missiles has Iran and how accurate they are. Even so, the 60 C-802 are enough a menace by themselves. An Iranian warship firing a Noor missile. Source: MidEastSecurity.co.uk. This is the most important sea warfare weapon Iran has. Originally called Moskit, it was designed at the end of the Cold War by the USSR specifically to avoid NATO anti-missile defences. First of all it is very fast, cruising at Mach 3 at high altitude and Mach 2.2 near the surface; at maximum speed this missile can cross the Strait of Hormuz from coast to coast in less than one minute. Secondly it is capable of executing random changes of direction when closing the target, thus making it very difficult for automatic defences to calculate its trajectory. This is a large missile, weighting 4.5 tones, capable of transporting a warhead of 320 kg; its range is reported differently at different sources but modern versions seem to reach more than 100 km. This technology was inherited by Russia whom has continued their development, producing more advanced versions. This family of missiles is usually referenced as the deadliest naval weapon in existence, with an accuracy rate over 99%. Visiting Moscow in 2001 the Iranian Defence Minister requested a demonstration of these missiles and was impressed enough to order an undisclosed amount. Apart from this information is scant, though speculation abounds. For sure Iran has this weapon, but in what quantities and exactly which version is not public. Was the order in 2001 the only one or has Iran continued to buy these missiles? Has Iran acquired older or modern versions, in particular the upgraded Yukhon? In the first years of the last decade, when it became known Russia was selling these missiles to China, India and Iran, speculation spurred that NATO had no effective defence against them. Being known for more than two decades at the time, NATO surely has had the time to study ways to defend itself against these weapons. Nevertheless, NATO has never faced such missiles in combat and considering the close distances in the Strait and the possibility of Iran using several of them in a simultaneous attack, the hypothesis of relevant damage inflicted in case they ever come to be employed seems reasonable. A Moskit missile. Source: Tactical Missiles Coorporation. Apart from these air borne missiles Iran also possesses torpedoes worth writing about. This is another weapon that attests Iran's abilities to produce warfare material. The Hoot is a supercavitating torpedo, meaning that it travels through water inside a gas bubble, thus greatly reducing attrition. It is much faster that any torpedo used by NATO, able to reach speeds of 200 knots, which should made it more difficult to defend against. It greatly resembles a defensive torpedo developed in the old Soviet Union that is still produced today by Russia, the Shkval, but in this case there are no reports of Iran having ever acquired the original. Claiming to have developed a totally independent design, Iran has successfully tested these home built torpedoes in recent years, always as offensive weapons. Notwithstanding its impressive speed, uncertainty remains on the effectiveness of these torpedoes, its range should be relatively small and should be noisy enough to be identified right from launch. As with all weapons produced by Iran, the main threat may the numbers available. Part of Iran's anti-ship weapons require some sort of naval vessel to be employed far from the shore. Iran's navy thus is another important piece of the puzzle. Most of Iran's submersible fleet is composed by midget submarines. This class of vessel was originally thought for infiltration operations, but in the Strait of Hormuz and the Persian Gulf they acquire different purposes. Their small size first of all allows them to be manoeuvred in the shallow northern shores of Gulf and secondly make them harder to detect by sonar. Iran has in recent years built 17 Ghadir class submarines, that are capable of deploying Hoot torpedoes. To these add 4 old Yugo class submarines built in North Korea from an Yugoslavian design. In the shallow waters of Iran these small vessels should be hard to detect and able to deploy mines and torpedoes without being immediately detected. Iran acquired 3 Kilo class submarines from Russia in the early 1990s. These are about twice the size of the Ghadir, and conceived specifically for anti-ship operations in shallow waters. They are built with special tiles that distort and absorb sound, making it harder to detect by sonar at long distance. An Iranian Ghadir class submarine. Source: The Asian Defense. These are small and fast attack ships, conceived for near shore operations. Iran has 10 Houdong class vessels built in China capable of carrying 8 large size missiles. In the late 1970s Iran ordered 12 Kaman class gunboats of which 10 are still in service. In recent years Iran was able to built 4 copy cat versions named internally as the Sina class gunboat. These 14 smaller vessels carry 4 mid size anti-ship missile launchers each. These are very small vessels carrying as single weapon two torpedo tubes. In order to be effective they have to get relatively close to their targets, thus largely exposing to enemy fire. They rely on their high speed to be successful, both in approaching the target and retreating back to safety. Iran has over 70 Peykaap class vessels, partially of its own making and another 10 Tir class units. Both of these models are reported to have maximum speeds in excess of 50 knots (over 90 km/h). A newer version, the Peykaap-II, has been fitted with two missile launchers. In 2010 Iran introduced 12 attack speedboats inspired in sports competition vessels capable of crossing the waters at some 70 knots (about 130 km/h). Called Zolfaqhar, beyond torpedoes, they can carry two small launchers to deploy Kowsar class missiles. Iranian officials have told the press mass production of this class of speedboat started in 2011; the exact numbers the navy may have at this stage is unknown. An Iranian Peykaap class speedboat armed with missile launchers. Source: Fars News Agency. Iran has several larger vessels that can also deploy anti-ship missiles. They are themselves relatively easy targets, hence their role in an armed conflict is uncertain. In recent years Iran has built 3 frigates, reverse engineered from 3 other bought from the UK before the revolution; to these add 3 corvettes acquired in the 1960s. It has also 6 coastal patrol ships (3 recently build and 3 legacy from the pre-revolution), 2 mine-layers, 14 hover-crafts and over 20 amphibious vehicles. Over 80 inshore patrol ships of assorted sizes and making, of which some classes are made in Iran. Air superiority - 60 or more jet fighters, of which 25 MiG-29 recently updated, 25 or more F-14 Tomcat and 10 Mirage F1. Multirole - over 150 jet fighters, of which 140 are 1960s F-4 and F-5 plus an unknown number of domestically developed Saeqeh (a copy of the F-5). Interception - 20 Chengdu J-7 jet fighters. Close air support - 13 Sukhoi Su-25 jet fighters. Ground-attack - 32 Sukhoi Su-24 plus an unknown number of Azarakhsh (the first attempt by Iran to copy the F-5, in development since 1997). Helicopters - over 50 of assorted designs and purposes, mostly built in US before the Revolution. An Azarakhsh type jet fighter in flight. Source: IranDefence.net. Chengdu J-10 - This is a state of the art multi-role jet fighter developed in recent years by China. With a maximum speed over Mach 2, operational range of some 2500 km and highly manoeuvrable, it is a jet fighter perfectly able to engage NATO fighters like the F-18 on equal footing. In the realm of non-stealth, manned aircraft, this is one of the best options in terms of technology for the money in the market today. Iran acquired two squadrons (24 units) that were delivered between 2008 and 2010. Iran's Air Force made a major leap with this acquisition. Chengdu/PAC JF-17 Thunder - This is a multi-role jet fighter developed by China to fulfil specific requirements of the Pakistani Air Force. With an operational rage of 1300 km and a maximum speed of Mach 1.6 it is not as powerful as the J-10 but much cheaper. Nevertheless it is able to face modern NATO aircraft, especially in defensive missions. Iran ordered an undisclosed number of these jet fighters from the Chengdu company in 2003. Due to the specificity of its requirements Chengdu renamed this version the FC-1. Production started in 2006 and from then on little is known. Sukhoi Su-30 - The Su-30 was born as a Soviet counter part to the F15E Strike Eagle; developed at the end of the cold war it was conceived primarily for air interdiction missions. With a range over 3000 km and top speed of Mach 2, this a jet fighter capable of engaging any other modern military aircraft. Years ago news emerged in Israel that Iran had ordered 250 of these jet fighters from Russia, a deal that would ascend to 2 billion US$; this was never confirmed and such high figure would likely had attracted much more attention. In 2008 again Israeli journalists claimed having observed a squadron of Su-30 jets in operations during war games in Iran, a claim once more unconfirmed. Though it doesn't seem likely Iran has hundreds of these aircrafts, it seems possible that jet fighters may be among all the warfare material it has been acquiring from Russia. In case Iran possesses any relevant numbers, say 2 squadrons, it becomes an entirely different military power in the region. This is one of the great mysteries in the chessboard of the Strait of Hormuz. A Chengdu J-10 in flight. Source: Air Power Australia. Completing the list of relevant weapons are Iran's anti-air defences. They may determine how well Iran can protect its military assets in the shores of the Persian and Oman gulfs. With another well advertised public demonstration Iranian officials announced in 2010 the serial production of the Mersad defence system. It is a fully digital radar and control system coupled to a missile launch pad, firing the Shahin missile. This missile is also produced in Iran, being an upgraded version of the US made Hawk missile, with higher and longer range and a top speed of Mach 2.6. Development of this system has been continuous and during 2011 a new version of the missile was successfully tested. Called Shalamche, it has a top speed of Mach 3 and a range of 40 km, it can hit a target 30 km away in less than 30 seconds. Deliveries of the Shalamche to Iran's Army started latest September. A Shahin missile being fired from a Mersad launching pod. Source: ArmyRecognition.com. The S-300 is a state-of-the-art air defence system initially developed by the USSR in the 1970s. It was inherited by Russia who kept developing, upgrading and selling it to a multitude of clients worldwide. This system is basically a semi-trailer truck transporting a radar, a firing control sub-system and a set of surface-to-air-missiles. Modern day versions can follow up to 100 targets, either jets or cruise missiles and engage 12 simultaneously in a radius of 150 km. After much speculation about a possible deal between Iran and Russia, in 2009 officials from both sides confirmed deliveries of the system would start soon. One year later Russia suspended all weapons sales to Iran in consequence of a United Nations resolution and the delivery wasn't completed. How many were delivered, if at all, isn't public, but it certainly was an insufficient number for Iran immediately started the development of its own version. Iran later claimed to have acquired further units from Belarus and another unidentified second-hand seller. Speculation exists also on a possible acquisition from Libya. In the wake of the débâcle with the original deal, Iran made of the development of a similar system a national design, involving top civilian and military scientists. Building on its experience with short to medium range systems Iran was able to complete the first prototype of the Bavar-323 last year. Up to the moment serial production hasn't been announced. Another ancient system developed in the USSR, inherited by Russia, sold to Iran and now replicated there. Russia has been continuously developing the system that is composed by a radar, a control system and a static missile rail. In modern versions it fires a 7 ton missile with a range of 300 km, a maximum flight altitude of 40 km and capable of flying at 7 times the speed of sound. Iran reportedly has 30 missile rails of this version, thought I couldn't find if it also possesses modern versions of the missiles. In any case Iran has for years been producing its own version, the Fajr-8, for which little to no information is available, apart from it being an upgrade to the original S-200. These missiles where thought in an epoch when high altitude nuclear bombers were the main strategic weapon a military power could have. In the narrow scenario of the Strait they may never come to have an important role, but provide Iran the ability to defend itself from air intermission at high-altitude. Beyond these, Iran possesses a further host of surface-to-air missiles, some acquired from Russia and China and others developed internally. They range from small portable anti-helicopter anti-aircraft rockets to large, long rage, anti cruise missile systems. Operational numbers are unknown for most of these. The larger part of Iran's military technology is outdated, with several pre-revolution legacy systems still in service. Iran has through the years learnt how to reverse engineer and replicate these technologies to the point were it now possesses very relevant numbers of weapons ready to use. These home grown technologies are often publicly displayed in war games and much celebrated by armed forces officials and politicians alike. Some of these weapons are effectively dangerous, like midget submarines operating in shallow waters. Others like the missile armed speedboats are very particular weapons whose effectiveness is largely unknown. These simpler technologies are menacing much more for their numbers than anything else. They probably give Iran the ability to sustain a military conflict around the Strait for some time. And then there are the many state-of-the-art weapons acquired from Russia and China in recent years. Regarding these, the information available to the public is scant, sometimes even contradictory, most arms deals have been shrouded in secrecy. The numbers and accuracy of these technologies are unknown in most cases, preventing a clear image of Iran's true military power. Is this uncertainty just part of an attempt by Iran to project an image of military power larger than what it actually is? Or is it part of the acquisition strategy, protecting sensible deals that could raise objections from the West? In any case, the few weapons known for certain to be owned by Iran, like the Moskit missile, the S-300 air defence system or the J-10 jet fighter are enough to caution any idea of immediate superiority by NATO over Iran. Naval Forces around the Strait of Hormuz, click for full size. Source: International Institute for Strategic Studies. Can an armed conflict erupt at the Strait of Hormuz? How can it come about? How wide can it develop? For how long can it disrupt commercial traffic? In this part I formulate four different strategic scenarios that contemplate these questions, though not precisely answering them. Scenario I – Direct engagement from Iran on commercial vessels at the Strait. In this scenario Iran would employ one of its many sea borne weapons to either attack or cut the way to oil tankers leaving the Persian Gulf. This could be done by torpedoing the vessel or targeting it with a small missile; alternatively Iran could simply deploy some if its navy close to the commercial routes and emit a warning that every ship trying to cross the Strait would be sank. The effect on oil prices would be immediate, in the second case even without firing a single a shot. It would be a sheer power defiance by Iran, aiming to guarantee that economic sanctions affect every major player in the region. This would certainly force an intervention by NATO forces in the region, a scenario that could develop in two different ways. If NATO opts simply for defending the navigation across the Strait then the multitude of weapons Iran has would likely guarantee a long period of tension with random attacks on both commercial and military vessels in the Strait. The economic consequences for the Asian importers would be dire and a worldwide recession would ensue. Otherwise NATO could opt for a large scale operation to bring down Iran's military capacities around the Strait. This would then resemble Scenarios II and III, whose outcome is not clear, especially in terms of conflict time span. I find this scenario the least likely of all. This would not only be an attack on oil importers, it would be above all an attack on the major oil exporters around the Gulf. Iran has little interest in getting at odds with its neighbours, especially in the case of the UAE, with whom it maintains a close economic relationship. Apart from the Emirates, Iran shares maritime oil and gas resources with Qatar, Saudi Arabia and Kuwait, that in some cases are already under joint development. And of course there is Iraq, with which Iran shares a long border that was the stage for a long and deadly conflict in the 1980s; certainly it is in no one's interest to revive such tensions. A bold action like the one proposed in this scenario would require a totally desperate internal situation in Iran, and even so, Scenario II would be more plausible. Scenario II – Direct engagement from Iran on military vessels in the Persian Gulf. Instead of attacking or menacing commercial vessels, Iran could opt for an engagement on NATO's naval forces in the Persian Gulf. The effect on oil prices would be about the same as in scenario I, but without the sense of a direct attack on Iran's neighbours. Such sort of engagement could come about as a consequence of some minor incident, such as a NATO vessel entering Iran's waters or an Iranian aircraft or ship being hit. An incident like this can easily be faked if needed, but unfortunately, the growing tension and the bellicose discourse around the Strait can also provide for a real episode where at least one of the parts feels compelled to larger actions. Invariably this scenario would lead to a large scale conflict, not only at the Strait but extending at least to Iran's long southern coastline. The outcome of such hypothetical conflict is very elusive, but one thing is certain, given Iran's profuse weaponry and extensive territory it can hardly be swift. Many uncertainties remain to devise the correct power balance in the Persian Gulf at this moment. Are Iran's wide range of anti-ship missiles and torpedoes capable of imposing damages on NATO's fleet? Not only is the effectiveness of weapons like the Russian Moskit unknown, it is neither clear the outcome of a wide simultaneous engagement with a multitude of anti-ship weapons on NATO's vessels. In the worst case NATO's fleet may be forced back to its naval bases in Saudi Arabia and the UAE and operate solely from the Gulf of Oman. If something like this would ever come to happen, oil shipments across the Strait would be certainly affected for a long period of time, the impact on the world economy would be devastating. A second question is Iran's capabilities in air defence. Can NATO project its air prowess as it did in the Balkans, Iraq or Libya? It will for sure face a sort of opposition it never did, both in the number and in the technology of anti-air missiles detained today by Iran. If adding to these Iran effectively possesses relevant numbers of modern day jet fighters, then air dominance over Iran becomes completely uncertain. Nevertheless, NATO retains technology that Iran has no known counter measures against, especially state of the art stealth aircraft built in the US. Hence it is certain that in case of such a large scale military conflict NATO can continuously target military objectives in Iran, eventually deriding its operational capabilities. The question is how long such conflict can last and menace oil shipments across the Strait. Stabilization of the region could require a sort of military commitment NATO might have never been forced into. How could this play out with a ramping oil price conflated with the ongoing economic environment is hard to envision. Though I find this scenario more plausible than scenario I, it still remains quite remote. Iran's government still has other options to explore before finding itself in a desperate situation where military action becomes attractive. In such scenario NATO would opt for a pre-emptive attack on Iran, both targeting Iran's Nuclear facilities and military assets around the Strait. This scenario has been spun both in Israel and the US, especially since Iran menaced to close the Strait in retaliation against the hardening of economic sanctions. While it has been largely dismissed by the wider political spectrum, it should be noted that from a strict military perspective this is the conflict scenario that could be less costly for NATO members. Taking the initiative, it could guarantee the shortest disruption possible to the flow of oil through the Strait. Most of this oil (85%) feeds Asia, NATO members are already in course to phase out Iranian oil imports and the strategic oil reserves coordinated by the IEA would provide means to accommodate the economical impact for some time. The first problem with this strategy is if NATO is not able to promptly achieve air superiority over Iran, in such case not being able to tame the country's menace to the oil flow in the Strait in a timely manner. As stated before, this largely depends on the numbers of modern aircraft and air defences Iran effectively possesses, if a relevant resistance to NATO's air power is achieved then a situation similar to the worst case of scenario II could develop. Finally, in the case a wider military conflict develops between NATO and Iran a much bigger question arises on how other military powers may react. In recent months military officials from both China and Russia have made it clear they wouldn't remain passive in face of such conflict. This discourse may be an important deterrent to this scenario or any wider conflict in consequence of scenarios I or II. With the information I could gather, it seems to me this option is risky (or at least uncertain) enough for NATO not to take at this stage. It should remain a remote hypothesis, at least as long as real evidence of a military nuclear programme in Iran doesn't come about. Finally I should point out that considering Iran's vast arsenal, a lone attack by Israel seems highly unlikely, at least with conventional weapons. At this stage the most likely scenario is for no bellic actions to take place. This scenarios has several requirements, but all achievable. In first place the Iranian government has to stabilize its currency, so far this has been achieved by cracking down independent trade of foreign currency and gold, first by disabling the electronic means to do so and then by outlawing such activities. On this regard more will have to happen, the government has to somehow re-establish public trust on the internal economic system. And then Iran must find ways to continue selling its oil, either by finding alternative importers, like Korea, that are not complying with US sanctions, or by “smuggling” oil to neighbouring countries, that then sell it as their own. The fact that about 30% of Iran's foreign trade takes place in the parallel economy can be an important start for this alternative trade. It is unclear what role the joint oil developments in the Persian Gulf may play, but they can provide a further workaround for Iran to maintain its oil revenues. Iran's economy will be undoubtedly impacted, but has seen in a previous log it is rather self-sufficient, especially in Agriculture. Some consumer goods may become difficult to get, as it is already happening with consumer electronics, but Iran should be able to provide the basic needs of its people in the short term and once again seek alternative sources for its imports. If this scenario unfolds, it could simply result in a regionalization of Iran's trade, geographically constraining commercial exchanges to the Middle and Far East. Naturally China can play a major role in this process, while some officials have been suggesting a compliance with the US line, it is of China's interest to keep Iran somewhat inside its sphere of influence. The only issue with this scenario is that it doesn't guarantee to the US and NATO that Iran's nuclear programme is halted. By the contrary, the technical advances of Iran's nuclear technology keep on going, as recently announced by President Ahmadinejad. Though no evidence exists that this programme has military ambitions, those countries fearful of such perspective, especially Israel, may get no reassurances at all from the increased sanctions. Will they rest quiet while Iran proceeds with the programme? This is why the previous three scenarios, though unlikely, are plausible. The balance of interests around the Strait of Hormuz can be analysed from a Games Theory perspective. All players profit from the trade that passes in both senses through this choke-point, any disruption has a negative impact on all of them; since they all stand to loose, no player changes strategy and the game remains in equilibrium. The sanctions imposed by the NATO members on Iran menace this equilibrium, they can eventually translate into an effective disruption of Strait, for the large part closing it to Iran. NATO has chosen this strategy because it now evaluates the equilibrium as having a negative impact: the hypothetical nuclear menace from Iran. On its turn, if the Iranian foreign trade is seriously impacted then further disruption to the Strait stops having a negative impact internally and a strategy change to active disruption becomes profitable because it has negative impacts on other players. NATO has indeed played boldly and it remains to be seen how deep the consequences may be. For now military action seems a remote hypothesis. Iran still has other options to maintain the Strait open to its ports, in spite of the sanctions. And naturally Iran can always at some point decide to abide to the inspections by the IAEA. From the NATO side military action appears likewise an unlikely scenario, Iran's prolific military technology seems a deterrent on its own, to which adds unpredictable reactions from other major players at the global scale. If a military conflict ever comes to develop around the Strait of Hormuz on the wake of this new batch of sanctions, it will be a definitive clarification of power over the region. In the three decades following the proclamation of the Carter Doctrine, wars in the region raged for a total of 20 years. NATO imports ever less oil from the Persian Gulf and its economic might has clearly waned during the last decade. Is the Carter Doctrine still affordable these days? Is it even practicable? A military clash at the Strait of Hormuz will for sure answer these questions.